I don’t celebrate Holi—ever since I was a little girl, I’ve had a horror of being wet and dirty, and come Holi, I used to insist on locking myself in. I was in good company; though my father was obliged to go and play Holi with his colleagues, Mummy and my sister were as intent on staying clean as I was. Come Holi, we’d happily feast on gujiyas and whatever other goodies came our way, but pichkaris, gulaal, and the rest? No, thank you. Not so with Hindi cinema, where Holi has been a big thing all along: the perfect situation for displays of affection, camaraderie, general love towards one and all. And I don’t think I have ever seen Holi depicted in a film without there being an accompanying song. That was what I’d first thought I’d do to mark Holi on this blog: a post of Holi songs. Then, looking back at the number of non-Holi songs that are about colours, I thought, Let’s give it a twist. Let’s talk about blue and pink and green and yellow. Let’s talk sky and trees and eyes and whatnot. Neeli aankhein, peeli sarson. Hariyali aur raasta. Ten songs, therefore, that mention—in the very first line—a colour. And, to make it less of a sitter, no colour repeated, except when it refers to a very specific shade. As always, these songs are all from pre-70s films that I’ve seen, and are arranged in no specific order. 1. Neele gagan ke tale (Humraaz, 1967): Blue. I was torn when it came to a song about blue. Neele aasmaani boojho toh yeh naina was the first song that came to mind; but that, while a lovely song, didn’t quite tick every box for me, for the simple fact that Madhubala (like Sharmila Tagore in Kashmir ki Kali) didn’t have blue eyes—and, anyway, with Mr & Mrs 55 being in black and white, even if she had blue eyes, you wouldn’t have known it. This song, therefore, which makes much of the blue sky. And what is more all-encompassing, all-pervasively blue, than the sky, which hangs above us all? Every other line of Neele gagan ke tale emphasizes this: everything happens under the blue sky. Love blossoms, the Earth gives of its bounty, the seasons pass. The picturization of the song, too, reinforces that: the sky, and its blueness, are very prominent here. 2. Gulaabi raat ki har baat gulaabi (Upkaar, 1967): Pink. The connotations of colours can be so different in different cultures. So stereotypical, too. Blue is for little boys, pink is for little girls. Pink is the colour of all things feminine: of cosmetics and lingerie, of less intimate clothing and of gemstones. Even of feminist movements that one would expect would have the guts to break free of this pink-loving stereotype that’s been forced on us women by a grossly commercial world. And in Hindi cinema, pink is (was? Before Pink?) the colour of intoxication. Gulaabi aankhein are eyes that brim with the wine of love. A gulaabi raat is a night of intoxication, of lust and madness and of losing oneself so utterly in mindless, self-centred debauchery that nothing exists outside that space. Gulaabi raat ki har baat gulaabi, as Laxmi Chhaya’s dancer sings. Everything about this intoxicating night is intoxicating. 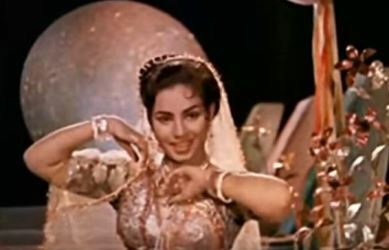 Interestingly, there’s very little obvious pink to be seen in the picturization: one of the partygoers is wearing a pink dress, but Laxmi Chhaya and her fellow dancers wear something that may be pink but may equally be peach. 3. 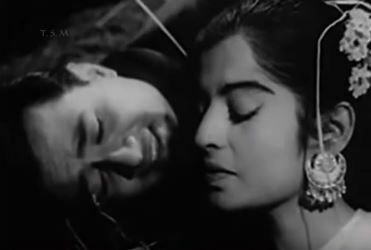 Bade hain dil ke kaale (Dil Deke Dekho, 1959): Black. Black is the colour of the night. It can mean gloom, it can mean the deepest sorrow: it is the colour of mourning. It can also be mysterious, enticing: a promise of adventure that may not be completely free of danger. And it can refer—both in English and in Hindustani—to someone wicked. A black-hearted villain, a kaale dilwaala. In Bade hain dil ke kaale, though, Asha Parekh’s character isn’t being completely honest when she refers to Shammi Kapoor’s character as being black-hearted. There’s more than a hint of mutual attraction here, and she makes it amply clear that while she’s deriding this blue-eyed boy for having a black heart, she actually admires those blue eyes and those smiling lips. (It is all a farce, because both of them are trying to fool the other, but that’s a different story). A delightful song. 4. Sar par topi laal haath mein resham ka rumaal (Tumsa Nahin Dekha, 1957): Red. 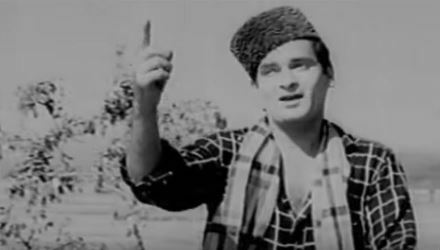 Shammi Kapoor again, and in—again—a Nasir Husain film (the one, in fact, which shot Shammi to fame). Red is one of those colours that features frequently in Hindi film songs. It’s the colour of everything from sunsets to blood, from a bride’s clothes to the colour of wine. A colour that prompts onscreen singers to sing of a bride going in her palanquin to her new husband’s home; to mourn over an addiction that will not be defeated; to weep over the blood spilled here, there, everywhere. And red, when worn, is the colour of boldness, of a joie de vivre that will not be suppressed. Raj Kapoor’s vagabond in Shree 420 sang of the red Russian cap that he wore; his younger brother here wears a different style of red cap: not signifying Communism as that Russian one did, but one that shouts out loud his boisterousness, his love for his sweetheart. He is too busy singing her praises to talk of his own attire, but she (played by Ameeta) sings of it: that red cap and that silken handkerchief have stolen her heart. 5. 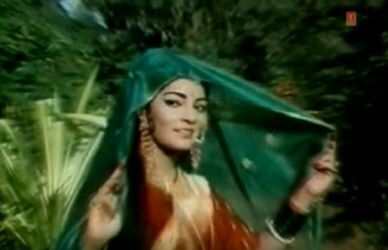 Hari-hari vasundhara pe neela-neela yeh gagan (Boond Jo Ban Gayi Moti, 1967): Green. While green, in the context of the English language, may imply envy, it is also the colour that’s universally associated with nature. The Earth, the land. Trees, plants, fertility: all of these are symbolized by green. Which is why, when Jeetendra’s village school teacher in the hills in Boond Jo Ban Gayi Moti begins his song in praise of nature, the first word that comes to him is the colour of the Earth: green. He goes on to sing of the colourful panorama: “dishaayein dekho rangbhari”, of the multi-coloured flowers and the blue sky above, but it all comes down to the verdure of the Earth itself. 6. Dhaani chunari pehen (Hare Kaanch ki Churiyaan, 1967): Pale green. Literally, the colour of dhaan, or paddy. Yes, still green, but more specific. In some parts of India (such as Bhojpur and around), green is also associated with weddings. Traditionally, brides wore green bangles for the wedding, and a chunari of a very specific shade—that of pale green, the colour of paddy or dhaan. Naina Sahu’s character in Hare Kaanch ki Churiyaan, in a daydream about the lover who has gone away, imagines what he’ll bring back for her: bangles of green glass. With those on her wrists and a dhaani chunari veiling her head and shoulders, she will go to be his bride. I’ll admit this is probably the one song in this list that I’m not really fond of, but at least the colour involved is a relatively unusual one: a change from the reds and blues so common in lyrics otherwise. 7. Mera rang de basanti chola (Shaheed, 1965): Yellow. Like dhaani (or, actually, several other colours—gulaabi, naarangi and baingani—pink, orange and purple), basanti too draws its name from something in nature: in this case, not a flower or a fruit or a vegetable, but a season. Spring, or basant, embodied in the yellow of mustard fields in bloom. 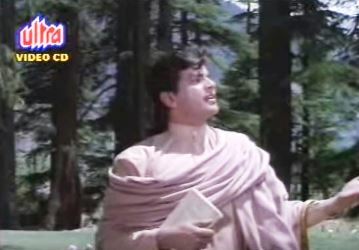 Another of Manoj Kumar’s films—Upkaar—celebrated this colour, this season, even very specifically the festival of Basant Panchami, in a song (Aayi jhoomke basant), but for me, the more iconic, the more poignant song, is this. While ‘yellow’ in English is equated with cowardice, the significance of this colour in Hindi or Punjabi is very different: it’s supposedly the colour of sacrifice, which is why the would-be martyr sings: Colour me, from head to toe, yellow. Mera rang de basanti chola was written originally by Ram Prasad ‘Bismil’, possibly in collaboration with several other revolutionary poets, and was one of Bhagat Singh’s favourite songs. There are conflicting accounts of whether or not he actually sang it just before he was executed in 1931, but Hindi cinema seems to have embraced that concept, with this song being repeated in just about every biopic about Bhagat Singh. 8. 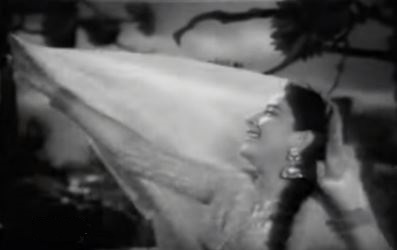 Dupatta mera malmal ka rang saleti halka (Adalat, 1958): Grey. Another of those colours that derives its name from something in nature. Unusually enough, the source word here is not even originally Indian: it’s slate, the grey metamorphic rock that splits so easily into layers. Not a colour one would expect to come across in a screen world dominated by pinks and reds and greens and other bright colours, but there it is. 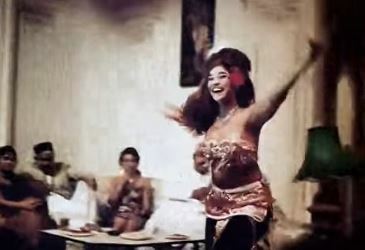 Nargis’s exuberant young dancer, performing on stage, sings of her muslin dupatta, grey in colour. From a score that had so many good songs that overshadow this one, Dupatta mera malmal ka is still a pleasant one. 9. Hansta hua nooraani chehra kaali zulfein rang sunehra (Parasmani, 1963): Golden. Gold is in another league altogether when it comes to lyrics. Talk of somebody being good, and they’re sone ke dilwaale (with hearts of gold). The bloom of youth and beauty is invariably equated with gold—even when there’s no trace of the golden in the loved one. (I spent years, before I finally watched Kashmir in Kali, in wondering if the woman referred to as having golden hair and blue eyes was actually a foreigner). Hansta hua nooraani chehra, while praising the perfection of a man (who’d have thought Mahipal was the one for whom this song was sung? ), can at least be considered somewhat correct. His hair is black, and his complexion—flight of fancy, this, or just the result of love being blind—is golden. A classic song of praise, upbeat and catchy, in a film that was pretty hilarious when it came to fantasy. 10. 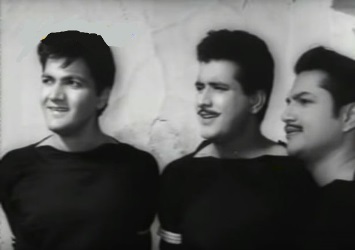 Aankhon mein kya ji, rupehala baadal (Nau Do Gyaarah, 1957): Silvery. And where gold is, can silver be far behind? While the more common word, in Hindustani, for silvery is ‘chaandi’, that can lead to some ambiguities in interpretation, since silver itself is referred to as chaandi. So, Allah-Allah woh de gaya chaandi chhalla implies that the ring is of silver (the metal, not merely the colour), Chaandi ka badan is slightly less obvious (though if you consider ‘sone ki nazar’ as the corresponding second phrase, then it would probably imply the metals in both cases, not merely the colours of the metals). So, instead of getting into ambiguity, I’m taking the easy way out and using a synonym for ‘silvery’: rupehala. What is in these eyes, asks the besotted lover. The silvery cloud, says his playful sweetheart. And yes, a cloud that’s silvery is far better than a cloud that only has a silver lining, isn’t it? Which songs would you have added to this post? Please share! चाँद सा मुखड़ा क्यूं शरमाया ? आँख खुली और जी घबराया….. I don’t agree with that one, actually – chaand-sa mukhda, according to me, doesn’t refer to her face being white, but being beautiful. Of course, I may be wrong. Now, this is what I call an informative article. When I heard dhaani chunar, I thought it must mean something about the quality of the chunariya. laal – laal laal gaal from Mr. X. Happy Holi, Harvey! And thank you; I’m glad you enjoyed this post, and learnt from it (I learnt stuff, too – I’ll admit I hadn’t known what rupehala meant; I always thought it had something to do with roop, and therefore perhaps meant beautiful. So I got educated, too! I love Laal-laal gaal. So glad you posted it. Kaare-kaare baadra is a favourite of mine, too. I had forgotten about Sharaabi aankhen gulaabi chehra – but remembered it on listening to it. Yup. Though it’s not in my list, I’ve mentioned it. a new thought, a different theme! incidently, all songs r by S J.
Kali Kali Raat Re Dil Bada Sataye- by Lata From Saiyan. Yes, Hariyala saawan dhol bajaata aaya is a great song. I have used it very frequently in lists, so decided I would leave it out for once. N-i-c-e! :) A lovely theme, and so apt for Holi. Of course, the first song that popped into my head when I saw the theme was ‘Hawa mein udta jaaye mera laal dupatta mulmul ka. I’m not sure that ‘laal is not technically in the second line, however. Thank you, Anu! Glad you enjoyed this song list. I had a tough time completing it – lots of red, lots of black, but so little of much else (white, for instance). Laal neeli peeli was new to me. What a fun song! I’d completely forgotten Main laal-laal guchkoon. Sweet. :-) And I’d forgotten the song from Shikari – I think I’d probably have chosen that one over Gulaabi raat ki har baat gulaabi for pink, if I’d remembered. Good song. There are a few Punjabi songs with ‘Kashni’ which is the color of the sky – Kashni dupatta waliye (Mussarrat Nazir) and Ik meri akh kashni (Surinder kaur) but obviously outside the hindi movie songs. Among the newer ones – Rang de mujhe tu gerua (saffron), which I like – don’t encounter many of those though. Thanks, Nishi! Glad you liked this post. I am a bit unsure about gora being used as a colour, per se. I’ve invariably heard it used in relation to complexion, and meaning fair, not necessarily white. When it’s used in other contexts, I have always seen gora meaning beautiful, But maybe I’m wrong. I had no idea kashni meant sky blue! Thank you for that. Plus, I had completely forgotten about gerua. I’ve always heard it refer to brick-red or terracotta, not saffron, which I relate to deep orange (the colour of saffron stamens and their resultant colour). Kesari or kesariya. I have been travelling and have also been busy with various things so I hardly get time to log on. I have noticed you have reviewed some interesting films, I will read them later. Yes, Shilpi, the post is about songs that aren’t about Holi, but refer to colours. Jaa re kaara badra fits right in! Thanks for this. Oh, man, does that resonate! I used to hide under the bed when I was a little girl. We moved to the States when I was eight and I was thrilled I didn’t have to deal with Holi anymore. Shudder. This post is a *much* more civilized and enjoyable way of celebrating colors. :-D Great set of songs, Madhu and I love the care with which you’ve selected the colors to present. The last one, aankhon mein kya jee” in particular brought a delighted grin to my face as I had never thought much about the use of “rupehala” in the lyrics despite having listened to the song umpteen times. I’m so glad you put in Katthai aankhonwaali. I kept coming across that song when I was researching this post, and hoped someone would post it. Nice way to celebrate colours! I too would not have associated some songs with colours. few more songs of colors…………….. Here also i think, its logical to connect the word aasmani to Sky Blue Color of bangles! i hope u will enjoy the songs! This is very interesting – I had always thought that song was Udi-udi chhayi ghata, as in the ghata is flying. I hadn’t known oodi meant brown in Marathi, but that makes sense to me. let others also comment on this! as its just my idea that it refers to a color! I hope someone else also sees this comment and is able to provide another opinion! उदी as an adjective in Marathi means snuff-coloured (तपकिरी रंग का, तपकीर meaning snuff). However, that meaning can’t be applicable in the context of the song. Since the poet is describing clouds in the month of ’सावन’, he probably means dark (rain-laden) clouds. Thank you for clarifying that! I suppose you’re right about the poet meaning dark (just as saanwle is used in some songs to refer to the night or the evening, when actually it refers to a dark complexion). i just knew, its a color used not very often, now a days! but it does refer to a color! so fits in the theme! this song has been used for many themes already, but fits here too………..
That is quite a collection! Some really nice songs there. Thanks. I heard ths majhali didi song for the first time! its so nice, i liked it a lot! Really enjoyed this post :) – very entertaining. I hadn’t heard (as far as I can remember) of balori before. How interesting. You’ll not be surprised to discover that I’d never heard this song before. Kaali teri gut te parainda tera laal ni is such an infectious song – I’ve liked it even back in the good old days of my youth, when I didn’t at all like most of the Punjabi pop that seemed to dominate parties or any type of gatherings in Delhi.Thank you for posting that, Bawa! Also loved Ik meri aankh kaashni; I am always happy when I learn new things – until Nishi mentioned it, I had no idea that kaashni was blue in Punjabi. Yes, Nidhi mentioned it too. It is written by Shiv Kumar Batalvi – he wrote some very nice traditional geeta too. One of my sisters and I were very scared of Holi too because when we were very young a large crowd of my uncle’s classmates turned up to play Holi from the neighbouring S D Govt College (of the Sahir fame) and you can imagine the rest… Holi we would go and hide behind the bed…not that they played much in my house. If I ever find Laal laal laal I will send you the link. We learnt it from a dear neighbour of Dogri origin. Madhu – I think you are perhaps talking this Sonu Nigam song – Kali Teri Choti Hai.. May be? It’s from a 1990 movie called Bahar Aane Tak.. Yes, Kaali teri choti te parainda tera laal ni is the Hindi version of the Punjabi song which Bawa posted. What I was trying to remember, however, was which song the Surinder Kaur-Narinder Kaur song reminded me of. I think it was just the ‘nachdi phiraan’ phrase which reminded me of Koi sehari babu, from Loafer. Love this song, true reflection of colours, beautiful music and brilliantly sung by geeta Dutt. Yes. As I mentioned in my post, this song was the first that came to my mind when thinking of blue. Glad you posted it. Neele aasmaani is a lovely song. What a beautiful way to celebrate Holi! Nice work..
Holi happens to be my favorite festival. I truly enjoy the free spirit where you can allow the inner child to come out and celebrate colors with others (of course as long as others want to be part of it). Having that kind of freedom is somewhat rare (without looking stupid if it wasn’t for the festival) and I have always missed that ever since I moved out of India. That one festival I miss the most. For some reason we have not been able to recreate that atmosphere anywhere else. Yeah, not a specific color.. Very strange dance moves by RK (perhaps the director trying to pull a Jitendra on RK). I used to sing this song when anyone in the family/friends had conjectivitis.. Which typo, by the way, I hadn’t even noticed. To each his own, Ashish! I am fine with people celebrating Holi as much as they please, as long as (like you mention) they make sure they don’t force more reluctant people to join. I’ve had my share of colleagues and friends who had a hard time accepting ‘no’ as an answer! I really like the songs you’ve suggested – and a couple of them (Gulaabi aankhen and Maine tere liye hi saat rang) were on my shortlist too. I had completely forgotten about the Devdas song, even though it had once been fairly popular. Thanks for that – as Harvey commented, there don’t seem to be too many ‘green’ songs around. Yes, of course. I hear you and I know that this does cause some major issues in that part of the world (growing up I spent 10 years in Gwalior, MP). It’s a shame that people abuse this festival to the extent that just the thought of it causes chills for many..
It’s fun for those who have a good group that is all out to have fun and everyone’s in on it.. That’s when it’s real fun. Here’s one more song. This one is from the eighties. one of the very few that I find tolerable. So glad to see you post Neele-neele ambar par, Ashish! Yes, this was definitely a breath of fresh air in the 80s – that decade was the one, I think, which was easily the worst as far as Hindi film music goes. Even the 90s had somewhat better music. … which reminds me of another song, also from the 80s, also featuring Sridevi, which has a colour in it. I must admit I am not fond of Surmai akhiyon mein, but I do know that this was vastly popular once upon a time. Interesting.. I liked this Yesudas song but you can tell it was a southern tune retrofitted to hindi lyrics which causes somewhat awkwardness. Surmayee perhaps means full of surma – as in black? Yes, I agree with the awkwardness – you have a good point there as to what may have caused it. Also, the nasality of Yesudas’s voice somehow doesn’t appeal to me here. I like him in a lot of other songs, but not in this. Surmai does mean black or dark grey. krishna o kale krishna is my all time favorite. i requast u listen it fully, u may like it! just the expected from such a song! I had never heard Kaali ghataaon jaa before. Lovely song, thank you for this one especially. I also like Krishna o kaale Krishna – watched the movie for this song, actually. I used to enjoy Holi in my younger days, but then it has been so long since I was in India, and in the North, that I can only enjoy it on TV now. But we do have a Holi function in our local Hindu Center, and I make sure to avoid going there on that day because I don’t want to get my clothes ruined. My most vivid memory of Holi is one in Lucknow, where a group of hijras came in and started singing and dancing, and wouldn’t leave, and my mother sent me inside so I didn’t get to see how it all ended! Thanks for bringing back nice memories! Oh, dear. The hijras coming in must have been quite harrowing! They can be scary – I remember being inundated by a flock of them the day after my wedding. I was at my in-laws’ home, and these hijras turned up demanding money and saying they wanted to bless the bride. It was creepy to sit there, with my head covered, surrounded by all of them as they clapped and wished that I would make them mausis within the year! Just the memory of it makes me feel embarrassed and awkward all over again. Thank you for Kesariya pagdi bani rahe< Lalitha! I had come across this song while researching this post, but couldn't include it, since I haven't seen the film. Glad you added it, especially since there don't seem to be too many kesar-kesariya songs. Yes, I’d have expected someone to have posted Teri neeli-neeli aankhon ke teer before – good song! Thanks for reminding us of that. i am surprised no one posted the song, i am about to post…..
may b becoz, it has the word in second line…. I did link to this song in the post, though I didn’t mention it by name. :-) Thanks for adding it. Just as a bit of trivia, the opening guitar notes have been played by an uncle of mine. yes, u were obviously refering to this song! i didnt get it that time though! Excellent post, thanks! I didn’t know songs from Hare Kaanch ki Churiyaan and Parasmani and they are beuytiful! I would add one bengali non-filmi song – because it is very beuytiful and because it became a Hindi filmi song Kahin Door Jab Din Dhal Jaaye Saanj. Bengali song name is Amay Proshno Kare Neel Dhrubatara and MD Salil Chowdhary used later his own tune for Anand. Bengali version is pretty philosofical – the hero tells with the blue pole star which asks him how much longer he remains directionless. Anna, as soon as I saw you’d commented, I hoped you’d posted a Bengali song – it’s always so lovely to hear one of these songs (perhaps that’s because I think Bengali is such a beautiful language, and of course it had some of the best composers and singers of that period – even many of them contributing to Hindi cinema). And for once, this is a song I have heard before. Absolutely lovely. Thank you so much! This is a great thread. As usual I’m late to the party and would normally refrain instead of saying something banal as Holi used to be wonderful as a boy in Delhi and add an indifferent song. But here’s this beautiful song that fits your criteria and has kesariya per your wish. Mero sayyan gulabiyon ka phool fro Nai Umar ki Nai fasal. You may be late to the party, but you bring along a lovely song! And one with an unusual colour too, at least when it comes to featuring in Hindi songs. Thanks a lot for this. Thank you! And good to hear kesar being mentioned – I thought there weren’t too many songs on this colour. oh metaphorically, kesar or kesariya is used a lot. you stayed away from holi songs categorically? they of course mention a lot of colours..
Arrrggh! How could I have forgotten this song?! I like it a lot, and it does feature two fabulous colours. Thanks so much for this, Anubha. Long time since I heard this song. I don’t like it much, but yes, it fits the theme perfectly. A tamil song from the y2k era, but very beautiful. I hadn’t heard Pachai nirame before, but the lyrics are lovely – so many colours! (and such lovely anomalies, too). Some Shahrukh Khan songs that feature colors. I must be the only one who has seen neither of these films! I was familiar with Satrangi re, but had to listen to Tumhi dekho na to catch the references to colours. Some lovely colours in the settings, too. But I want to add one more song though the word ” NEELI ” comes in the last line of the ” mukhada “. 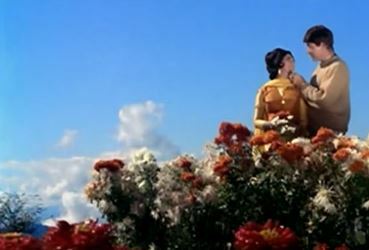 The Lyrics by Pram Dhawan , eye – candy Shammi Kapoor nd Bina Rai , the tune by Roshan — each nd every thing is nice. Thank you! This song from Vallah kya baat hai was on my longlist, but I dropped it because the colour reference comes too far into the song. But a lovely song, nevertheless. There were some good songs in this film; pity the film itself wasn’t that great. Awesome list, I was looking for colour name songs, not just holi songs. Thank you so much.